I didn’t like this book the first time I tried to read it. I didn’t like it the second time I tried to read it. I say “tried” because the first two times I couldn’t get through it. I got about 20 pages end and felt like I was still looking for the beginning. This review is based on the third time I “read” it. And like the last couple reviews (Influencer, Primal Leadership) I listened to Seven Habits. I made it through and figured out why I struggled with it so much the first couple of times. First though, the stuff I liked. 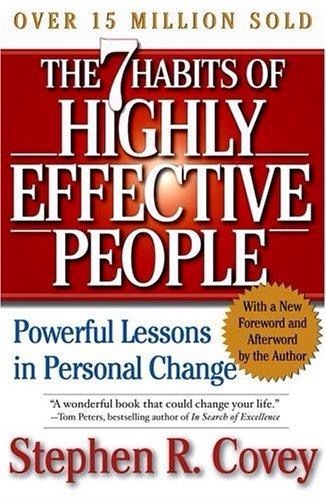 I purchased the version of the book that Stephen Covey read. I’m happy I did. Much of the book is personal stories that Covey tells about his family and his kids. It would have been jarring, I think to hear someone saying, “I did this” and have it not be Stephen Covey saying it. Eventually, it felt more like he was simply telling old family stories, rather than reading his book. Much of the material in the 7 Habits matched my own philosophy. For example, Covey explains that once basic needs are met the no longer make an effective motivator. I’ve written before about how Money is a Lousy Motivator. But, money is only a lousy motivator if you already have enough. I found very little in the 7 Habits that was new or that I disagreed with. And that added tremendously to the book. Covey offered a unique and new perspective on things I already believed. Finally, I very much enjoyed the Quotes, quotes and more quotes. Covey tried to convey the universalness of the 7 Habits. That was greatly enhanced by the many quotes from other teachers, philosophers and business leaders. On more than one occasion, he quoted someone or something that I had already read. Again, it helped make the book much more relatable. It took me listening for two and a half hours before I figured out why I struggled with the 7 Habits. That was the point at which Covey introduced the first habit. The entire book was about thirteen hours, so it was almost a quarter of the way through the book before we got to the topic of the book. Covey talks about the difference between the right-brained non-linear thinker and the left-brained list-maker. And then he publishes a book that has a number in the title and doesn’t give you the list for dozens of pages. My left-brain was going like crazy trying to find the beginning of the list for the first couple of hours. He could have solved it, for me, anyway, by putting the list in the introduction and then launching into the background information. The voice work was excellent with one exception. When he introduced Habit 5, his voice changed dramatically. I wondered if it was the same person. The voice was similar but vastly different. It was probably that at the end of one section he was tired and his voice was soar and at the beginning of the next section he was fresh. What ever it was, it was enough to throw me out of the book for about five minutes. The only real criticism I had with the content, was toward the end of the book Covey attempts to pull it all together. As he’s doing that, he touches on other conflict resolution methods. And they don’t come off particularly well by comparison. He’s hugely dismissive of reflective listening, or really anything except his own methods. Having dealt with major conflict in my life and can tell you that sometimes you goal isn’t win-win. Sometimes your goal is to avoid lose-lose. As a result you work to keep yourself in the “civil discussion” zone. Reflective listening has been very helpful for me in these cases. It keeps us in the room until we can master our emotions and get into a position for win-win. The 7 Habits are very powerful, but they are not the only way to be effective. It was disappointing to hear Covey dismissing other methods. Earlier in the book he even points out that the enemy of the good is often the great. Don’t dismiss the good just because you think you have something great. The 7 Habits of Highly Effective People will give you the tools you need to be effective. It does exactly what it says it will. Even if you only pick one or two habits to start on, following Covey’s advice will have an instant positive impact on your life.